Did you feel happiness when Rom come back? Why do you support Harmony? Post a picture of what you think Hermione's wedding dress would look like? 1. Ginny is nearly a carbon copy of Harry's mother, and normally, you'd not want to end up with someone like your mother. It's disgusting! As if you're beijar your own mother. 2. Even though the filmes show mais chemistry between Harry and Hermione, Hermione and Ron, in the books, always fight about at least one thing in every single book. I decided to use the word ‘relationship’ for this pair because its the best term to describe them and “charged moments” just the two of them, something special which Harry and Ron do not share nor do Hermione and Ron, its these moments which make Harry & Hermione a relationship that is worthy of its nickname which the fandom has given to them - Harmony. You can say BUT JAMES AND RON ARE PRANKSTER!!! CAN YOU SEE WHAT I DO HERE? I found this post on tumblr, can't remember the exact blog url so if anyone recognizes it I can add it in the credit/source at the end! Definitely one of my favorito artigos on Harmony for sure! 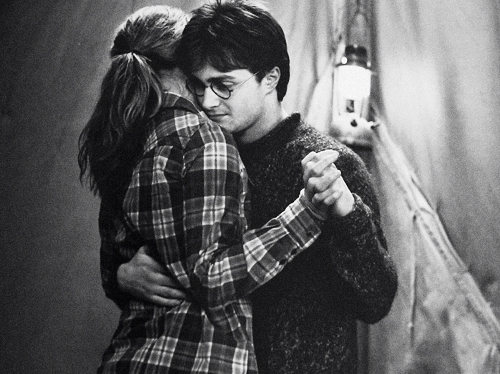 When asked why I ship Harry/Hermione (Harmony), I realize ‘because they’re perfect for each other’ doesn’t cut it. So here, in semi-order, are the topo, início 5 reasons I ship Harmony. I understand these will intermingle at points but I’m going to try to keep them as separate as possible. In a new interview conducted por Emma Watson, Harry Potter author J.K. Rowling drops a bombshell: She’s not so sure she should have put Ron and Hermione together. The shocking revelation came in the new issue of Wonderland, of which Watson is a guest editor this month. The comments were obtained por The Sunday Times. Ron:I hear that you and hermione are an item now huh. Harry:yea so what do you care. Harry:no it's not you broke up with her. Ron:I was going to apolegize when I over heard that you ask her out. Ron:what do you want to tell me that you and harry are going to makeout huh. Ron:hermione don't cry but if you are then I have to tell you something I like lavender so I'm breaking up with you for lavender sorry. Hermione:huh sniff you know what Ron fine I don't care just leave. What filmes is This from?